AE3 was the Associate Architect for the Alice Griffith Phase III project in San Francisco. Alice Griffith was an existing 256 unit public housing development owned and managed by the San Francisco Housing Authority. 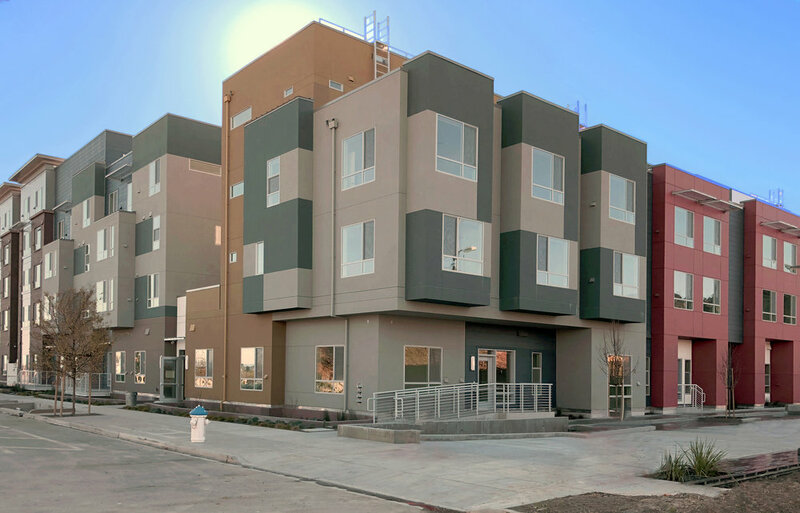 Redevelopment was part of a Choice Neighborhoods Implementation (CNI) Grant through the U.S. Department of Housing and Urban Affairs and also a strategy for redevelopment in the Hunters Point Shipyard and Candlestick Point area. The development included a management/leasing office, community facilities, structured, on-site parking, tot lots and green space. Phase III (Block 1) provides 122 new apartment units of Type V construction over a Type I concrete podium. The building consists of one, two, three and four bedroom units in four stories over a podium along with three bedroom townhouses. The at grade units face the street creating an engaging, active and safe streetscape. Each building has a landscaped courtyard on top of the podium and community space. Emphasizing energy efficiency, occupant health and durability, the project is designed to meet LEED for Homes Mid-Rise Gold Certification and exceeds the 2008 Energy Code requirements by 15% and includes 25% fly ash or slag in the concrete.